The government’s major earnings will come from tax revenue while it will spend the most on devolution to states. New Delhi: As Finance Minister Piyush Goyal announced the interim budget for 2019-20, ThePrint takes a look at how the Modi government plans to earn and spend its rupee in the coming year. For every rupee, the government will earn 21 paise from corporation tax and goods and services tax (GST) each, while another 19 paise will come from Borrowings and Other Liabilities. Other sources of income include 17 paise from income tax, 8 paise from non-tax revenue, 7 paise from union excise duties, 4 paise from customs and 3 paise from non-debt capital receipts. 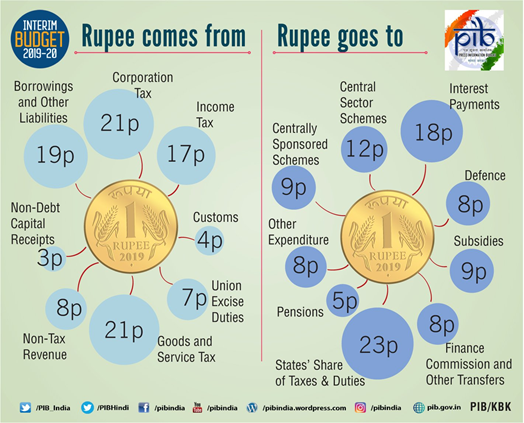 The highest component (23 paise) of the rupee earned by the government will go to states’ share of tax and duties as part of devolution of income to states. Another major chunk of 18 paise will go as interest payments. 9 paise of every rupee earned will be spent on centrally sponsored schemes and subsidies each, while another 12 paise will go to central sector schemes. The government will further spend 8 paise on defence and finance commission and other transfers each. While 5 paise will be spent on pensions, 8 paise will be spent on other expenditure. 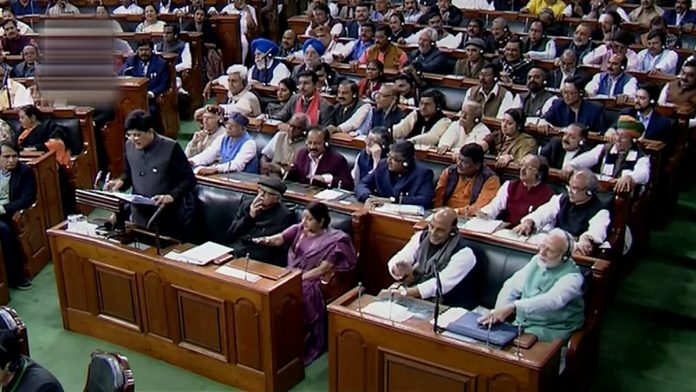 Meanwhile, the interim budget, in which large-scale changes were announced in direct taxes, gave a series of tax sops for the middle-class, including a full tax rebate for income up to Rs 5 lakh. The move could potentially benefit three crore taxpayers, said the government. Goyal also announced an increase in the standard deduction limit to Rs 50,000 from Rs 40,000. The government also increased the limit on tax deducted at source on bank and post office deposits to Rs 50,000 from Rs 10,000. Economists expect the measure to free up income in the hands of the people, providing a major consumption boost to the economy.